Dash Mate® is unique in that it does not have a hard backing. The Ultimat® fabric is so advanced it holds it’s moulded shape without the need for potentially damaging hard backing. The fabric not only breathes, it also absorbs unwanted toxins that are emitted from the vinyl of the dashboard and cause discolouration if left trapped underneath the dashmat. 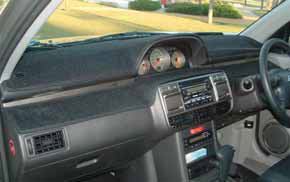 Dash Mate® covers come in colours to compliment the interior of modern vehicles.